Brief：China and US.are related to intellectual property rights, technology, trade statistics, energy and business cooperation. China and the United States signed five economic and trade agreements on Monday. The agreements are related to intellectual property rights, technology, trade statistics, energy and business cooperation. 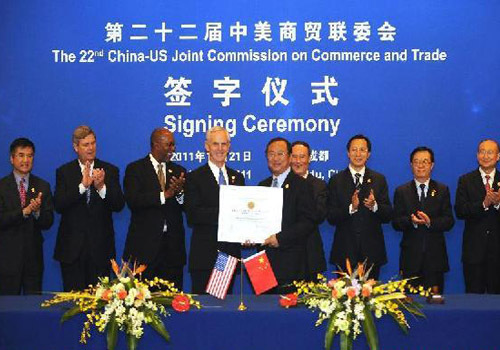 A signing ceremony for the agreements was held after the 22nd session of the China-U.S. Joint Commission on Commerce and Trade (JCCT), held in southwest China's city of Chengdu. Vice Premier Wang Qishan co-chaired the meeting with U.S. Commerce Secretary John Bryson and Trade Representative Ron Kirk. 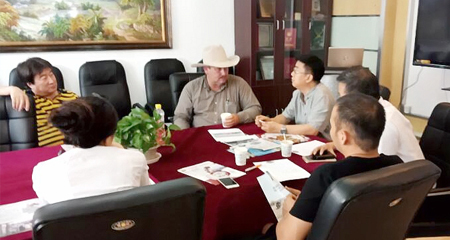 During the session, John Bryson awarded the China Council For The Promotion of International Trade (CCPIT) with the Peace through Commerce Medal for its efforts to promote Sino-U.S. trade. The award, commissioned by Thomas Jefferson in 1790, recognizes organizations or individuals who have made great contributions in expanding U.S. exports and attracting overseas investment. China and the U.S. are each others' second-largest trading partners. The total value of Sino-U.S. trade amounted to 385.3 billion U.S. dollars last year.